Psymoon Records presents Darker By Light, the second album from M.Y. 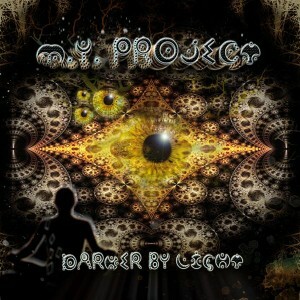 Project, a psytrance producer originally from Chile now living in Finland. Described as “music for active meditation”, this highly conceptual album aims to share knowledge and inspire individuals to make positives changes in their lives. Melodies, sounds, and BPMs are aimed at getting the listener into deep states where they can see their own fears directly, face to face. The rhythms are strong and aggressive to make a root connection between the feet of the dancers and the earth, kicking the ground hard, as many aboriginal tribes do in their own dances. Bass lines are focused on the feet, melodies on the heart, and high frequencies on the mind. Despite the use of “horror thematics”, this album is not strictly dark; there are also several hilarious moments in the labyrinth of mind where a listener can laugh, dance, and be reborn. Music, design, and mastering by M.Y. Project at Master Studio, Finland. super album, with a very fresh kind of sound. i love all the story, the breaks and changes are just amazing, thanks Mack for this new one ! Seriously, really mystic trip , I love it! AMaaazing artist and greaaat album !! M.Y. PROJECT is one of the best dark psychedelic producer ever. Never ever 1 copy paste, originality is his best weapon. Thanks for this work ! lo conservan aun lo agravan.